Sydney Anglican-associated publication says early Genesis is ‘figurative’. It was encouraging to see this Anglican Church (just down the road from CMI–Australia’s new office building, actually) take a stand against the dominant cultural trend. The Sydney Anglican diocese has consistently taken a stand on the authority of the Word of God—up to a point as we shall see—even in the face of criticism, mockery and hostility. At present, the diocese is upholding scriptural standards within the worldwide Anglican Communion, which is embroiled in controversy over the ordination of homosexual bishops. It is interesting that these two issues should appear in the same publication because they are connected. However, on the creation/evolution issue the position advocated in The Briefing is very different. Instead of accepting what the Scripture plainly says about how God created, The Briefing promotes all sorts of ways that Christians can harmonize their thinking with the ideas of our modern culture. 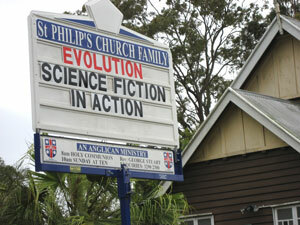 The lead article by Sandy Grant, Senior Canon at St Michael’s, Wollongong, is entitled ‘Reading Genesis’. He freely acknowledged that Genesis literally says that the creation days were six 24-hour periods, that this is indicated by the context, and that the God of the Bible is big enough to do what the Bible says he did. The point of the article, it seems, is to find a biblical justification for not accepting Genesis as written. If Abraham and Isaac are real people doing real things in real time, then when did the genre of Genesis switch? Why is it that Jesus did not recognize the change in genre? Why did he refer to Abel as a real person? I must say I am confused about the term ‘figurative history’. If chapters 1–11 are figurative, does that mean that chapters 12–50—which has exactly the same genre—are figurative too? But if Abraham and Isaac are real people doing real things in real time, then when did the genre of Genesis switch? Why is it that Jesus did not recognize the change in genre? Why did he refer to Abel as a real person? Why did Luke mix up real and figurative people in his genealogy? Why did the writer to the Hebrews include figurative people with his real heroes of the faith? (See also Genesis: Bible authors believed it to be history). The literary framework and figurative genre are the thrust of Henri Blocher’s book In the Beginning which is favorably recommended in The Briefing.5 In James Davidson’s review he described the conflict he encountered in Genesis during his geological training, and said that Blocher answered all his questions about Genesis. But he won’t accept a straightforward reading of Scripture because ‘The rejection of all the theories accepted by the scientists requires considerable bravado.’ In other words, the world’s scientific culture takes precedence; so despite Moore College’s claim to believe in Sola Scriptura, they in reality promote Scriptura sub scientia. And in order to avoid the plain meaning of the text, Blocher develops a convoluted argument about literary genre and figurative history. But Falk is wrong on two counts. First he is wrong on his facts. In his book and lectures he misrepresented the Galileo Affair, was subjective, inaccurate and out-of-date with the scientific evidence, and displayed an almost total disconnect between scripture and the real world. No—we do not need to surrender biblical Authority. ‘Charles Darwin … destroyed the primary myth [figurative history?] by which we had told the Jesus story for centuries … That myth suggested that there was a finished creation from which we human beings had fallen into sin, and therefore needed a rescuing divine presence to lift us back to what God had originally created us to be. ‘But Charles Darwin says that there was no perfect creation because it is not yet finished. … there was rather a single cell that emerged slowly over 4½ to 5 billion years, into increasing complexity, into increasing consciousness. One effective way of making an impact is to offer the Book 15 Reasons to Accept Genesis as History to your church leaders. It deals with all the issues in only a few pages—in other words it’s short enough that they may likely read it. However, although Spong is logical and consistent, he is wrong because he is wrong about evolution being true. See also a refutation of his many errant ideas about the Bible, theology and morality. Note also, there will be a detailed refutation of Falk by Alex Williams in the next issue of the Journal of Creation (20(3)) [update: the review is now posted: Taking firm hold on an illusion.]. And if there is to be any hope of the liberals in the Anglican communion changing their minds, as Dean Phillip Jensen urged, then the issue of evolution, the major obstacle to their accepting biblical authority, must be dealt with. That is why Christians need to understand a few basic concepts about how science works, like the difference between operational and historical science. It is important to realise that with historical science all the so-called scientific facts are not facts but interpretations of facts. And the billions of years are not measured but assumed. Christians should be aware that evolution over billions of years is an idea, a philosophy, that has arisen because scientists have been purposely ignoring the real history of creation and the Flood, as the Apostle Peter so clearly warned 2 Peter 3:3–7. We should be informed about the abundant evidence that is consistent with a plain reading of Genesis and of the fact that many respected scientists believe in creation in six days some 6,000 years ago. If we are informed, then, even if we don’t know all the scientific details, we will have sufficient knowledge, experience and respect for the Scriptures to be sceptical of the conflicting claims scientists are making in our world today. The position advocated by The Briefing is neither biblical nor scientific. It is a no-man’s land and unstable in the long term. Thus, the Sydney Anglican Diocese will inevitably move from the position advocated in The Briefing. The question is: which way? ‘I’m a general practitioner in [name of town] ([name] Anglican Church) and have moved over the last 8 years from evolutionist (+God) to theistic evolutionist to progressive creationist to arrive, only in the last couple of months, at young earth creationist. This is despite having been given a copy of Ian Plimer’s book about 9 years ago which, as intended by the giver, gave a very negative view of YEC. I have now found the rebuttal on the web page, but this was after my change of heart, which was obviously in God’s good time. I am pleased that the editors of The Briefing had the courage to bring this issue into the open. It is a good development and should motivate us to prayer and action. I have long admired the Sydney Anglicans, their stand and their achievements. I pray for their leaders often, especially when I hear the media mocking them for standing up for the Gospel. We need to pray that there may be a breakthrough, that there will be a willingness to also submit to the Word of God in this foundational area. The secular world recognises that it is vital to their humanistic philosophy and vehemently defends evolution. In fact, they recruit the liberal churchians to support them in their efforts. Please pray that the eyes of prominent leaders of the churches and theological colleges will be opened and that they will have the courage to change their minds on this issue. What a difference that will make in the world Anglican Communion. The design of Genesis, The Briefing 337, p. 3, Oct. 2006. Return to text. Jensen, P., The future of Christianity, 10 Oct. 2006. Return to text. Jensen, P., The world Anglican Game, The Briefing 337, p. 30, Oct. 2006. Return to text. Thompson, M., Searching for clarity, The Briefing 330, pp.9–12, March 2006. Return to text. Davidson, J., Review: In the Beginning, The Briefing 337, p. 22–23, Oct. 2006. Return to text. Blocher, H., In The Beginning, Inter Varsity Press, Leicester, England, pp. 39–59, 1984. Return to text. Is Intelligent Design good science? The Briefing 337, pp. 17–19, Oct. 2006. Return to text. ABC TV Compass interview with Bishop John Shelby Spong, by Geraldine Doogue, in front of a live audience at the Eugene Groosen Hall, ABC Studios, Ultimo, Sydney, Australia, 8 July 2000. Copied from transcript at , 6 August 2001. Return to text.